First worn: August 14, Amsterdam. Most of this top was crocheted on various trains throughout summer. It was finished just in time for an impromptu mid-August weekend in Amsterdam. I scrambled so much to finish this in time for Amsterdam (staying up late at night to do the seaming and weave in the ends), that wherever I wear it, or see it in my closet, I think of it as “the Amsterdam top”, despite the design’s name being Menorca! The design is from the Summer Crochet book published by Rowan, which I already told you about – this is my second project from this book. I happened to see the crocheted model (in cream) displayed at John Lewis’s in Oxford Street, only a couple of day after I’d started mine, which was quite motivating. For the first time, I used the recommended Rowan Siena, which for some odd reason is cheaper here in Southern France than it was in London. I was initially planning on using the white or the ecru shade, but fell in love with the antique mauve shade when I saw it in the shop, and there was no turning back. This yarn is amazingly beautiful, and adds so much to the finished work. 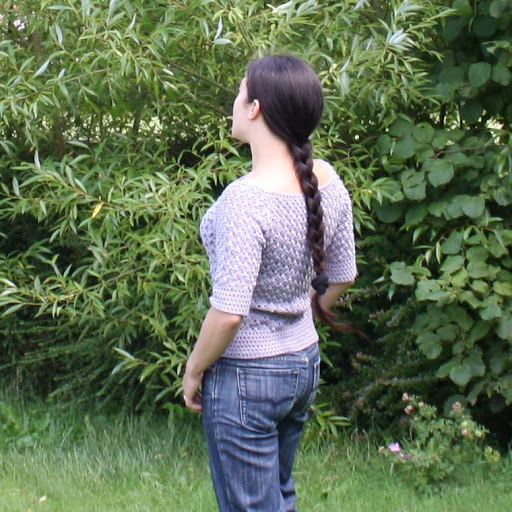 It was well worth the price (I paid a total of 36 euros for the 8 skeins I needed to make this pullover). This was rather work intensive, but I do love the puff stitch. Front side: 102 ch sts. Width at bottom: 44.5 cm. Neckline: mine ended up higher and tighter than in the picture, and than was really comfortable, so I frogged part of it and only did 1 “eyelet” row. It also looks less fussy this way. I love that this top both boldly asserts itself as crochet work with its notable puff stitch, while being cute and definitely modern, thanks to the clean cut, the three-quarter sleeves, and the boat neckline. This is definitely my favourite crocheted garment to date, and the one I’ve been wearing most. wow, that design looks work intensive indeed. very intricate. 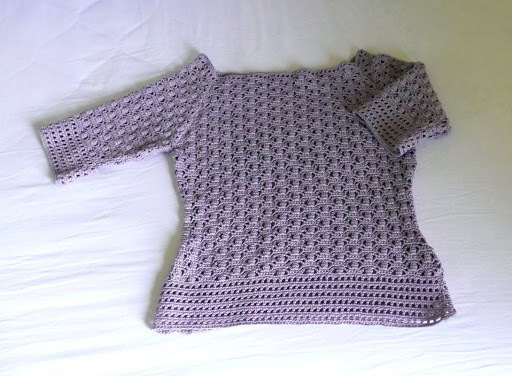 lovely top, must take a lot of hard work and skill to do crochet. Very beautiful! I love the color, the silhouette, the crochet pattern. I'm sure you'll wear it for years since it's both lovely and versatile. Very cute! You are right, it looks modern. Your top is awesome. You show, that crochet does not have to be boxy! This is so pretty on you! I love the intricate pattern of it and the color is gorgeous. Wow, that is absolutely beautiful! Everything is right about it: color, pattern, fit — and modernity. Makes me want to take up crochet, although with my proven non-dexterity in knitting, I'm reluctant. You have been crotcheting up so really cute things. This one is no exception. Pretty colour too. Just gorgeous Isabelle! Lovely choice of colour and I love the texture of the puff stitch. Beautiful. This is a beautiful top…both the color and the crochet. I love this top and that color is so flattering! Il est adorable ce petit haut, tu as bien fait de choisir ce joli mauve, cela le rend bien plus original (et peut-être aussi moins salissant) que du blanc ou du écru. très bel ouvrage, bravo et tu as réussi à l'adapter à ta taille, rebravo! Beautiful top! Love the color and the puff stitch! Very nice! I prefer this color over the orginal choices of white or ecru. 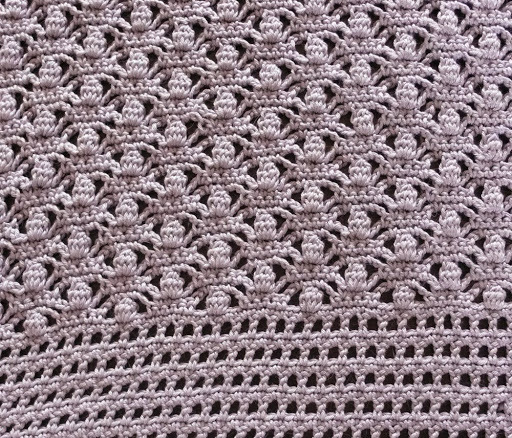 The “puff stitch” is amazing!